547 pages | 183 B/W Illus. 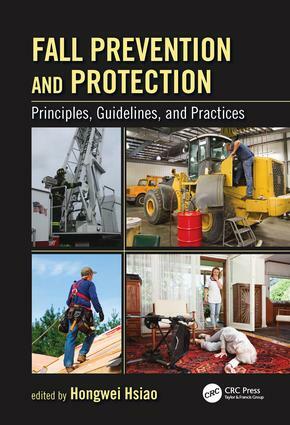 This book covers a wealth of knowledge from experts and informed stakeholders on the best ways to understand, prevent, and control fall-related risk exposures. Featured are subjects on: (1) a public health view of fall problems and strategic goals; (2) the sciences behind human falls and injury risk; (3) research on slips, trips and falls; (4) practical applications of prevention and protection tools and methods in industrial sectors and home/communities; (5) fall incident investigation and reconstruction; and (6) knowledge gaps, emerging issues, and recommendations for fall protection research and fall mitigation. Fall Problems as a Public Health Matter. Sciences of Human Falls and Injury Risk. Research on Slips and Trips. Falls from Elevation. Evidence-based Applications—Research to Practices. Fall Incident Investigation and Reconstruction. Regulatory standards and industrial guidelines. Knowledge gaps, emerging issues, and recommendations for fall protection research and fall mitigation. Dr. Hongwei Hsiao serves as Chief of the Protective Technology Branch within the National Institute for Occupational Safety and Health (NIOSH). He received his degrees from Cornell University (Ithaca, NY) and the University of Michigan (Ann Arbor, MI). He has held product design, engineering, and management positions in industry. Dr. Hsiao joined NIOSH in 1991 and has been instrumental in expanding the NIOSH Human Factors and Safety Engineering (HFSE) programs. He has developed seven new laboratories for fall prevention, virtual reality research, three-dimensional (3D) anthropometry, high-impulse trauma experiments, human motion analysis, sensor systems testing, and digital human modeling. He is a highly proactive manager who is dedicated to the advancement of his staff. He has mentored numerous service fellows and international scholars; all are now successful professionals. He is also an active proponent of strategic goal achievement and is frequently invited to speak on program development and related strategic issues at international organizations and conferences.